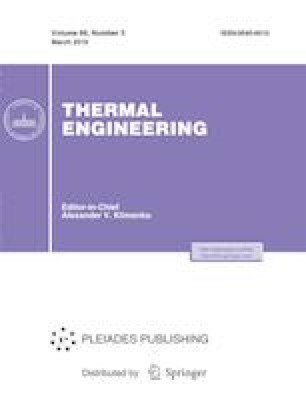 Results are presented of the experimental investigation of gaseous fuel combustion in a combustor comprising two zones in series each of which has its own burner unit (BU). The first burner unit (BU1) is a conventional one for low-emission combustors. It contains swirlers, a fuel-air mixing zone, a pilot burner, and a main burner. BU1 is fed with a premixed fuel-air mixture (FAM). The second burner unit (BU2) is located downstream along the flow, behind the first combustion zone. It is supplied with gaseous fuel (i.e., natural gas) without premixing with air. Diffusion combustion occurs in the second zone. The potential was studied for extending the stable operation range of the first combustion zone to the range of low excess air factors by creating radial nonuniformity in the FAM concentration at the BU1 outlet. This is accomplished by feed air in one hole in the fuel tubes above the vanes of the main burner swirler. The best FAM concentration at the first stage minimizing NOx and CO emission during joint operation of two combustion stages installed in series was determined. The results of the experiments with BU2, which is a thick hollow disk with a nozzle-shaped orifice with holes in the bore surface for fuel injection, are presented. The experiments were carried out with a model combustor in the test facility at OAO VTI. This work was supported by the Russian Scientific Foundation, agreement no. 17-19-01563.